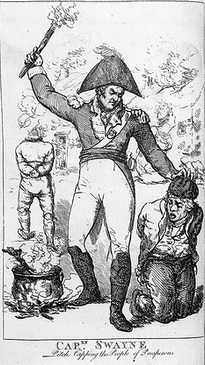 "Captain Swayne pitchcapping the people of Prosperous"
Pitchcapping was a form of torture used by the British military against suspected Irish rebels during the period of the 1798 rebellion, most famously on Anthony Perry, one of the leaders of the Wexford Rebels. The process involved pouring hot pitch, or tar (mainly used at the time for water proofing seams in the sides of ships and boats), into a conical shaped paper "cap", which was forced onto a bound suspect's head, allowed to cool, then rapidly removed, taking with it a portion of the suspect's skin and tissue. Less elaborate versions included smearing a cloth or piece of paper with pitch and pressing onto the head of the intended victim such as described by Myles Byrne*  in his memoirs. "Flogging, half hanging, picketing, were mild tortures in comparison of the pitch caps that were applied to the heads of those who happened to wear their hair short, called croppies; the head being completely singed, a cap made of strong linen well imbued with boiling pitch was so closely put on that it could not be taken off without bringing off a part of the skin and flesh from the head : in many instances the tortured victim had one of his ears cut off to satisfy the executioner that if he escaped he could readily be discovered, being so well marked. " The torture was usually preceded by the crude shearing of the victim's hair/scalp. The effect on the skull of this controlled form of local boiling somewhat resembles scalping, earlier known as a practice used by the colonists in North America and American Indians on each other. Pitch has long been used (like other hot liquids, even melted metal) to pour into a victim's orifices. However, both those techniques were usually faster and often lethal, so less suitable as torture proper, rather as capital punishment.